Holy schnikes, a lot has changed in a year! Shark Tails turned one, I became a contributing author at Remodelaholic, and Matt lost even more hair. If I had to guesstimate, I would say he’s about 18 months from full on Sir Patrick Stewart status. …it’s also been a year since I ripped up the carpet in our bedroom and laid plywood plank flooring. This has been hands down my only most popular post to date and been shared a ton on Pinterest. I get a lot of questions and comments about the floors, many of which I had myself before I took the plunge. A: I clean them just as I do my other floors — I don’t! HAHAHAHAHA — relax I’m kidding. I clean them the same as I do my hardwoods. I vacuum them weekly, and use my Swiffer Sweeper with wet mop pads as needed. Every few months when I do a “deep” clean of the house, I full on mop them with Pine Sol. They are very easy to maintain. Q: Does dirt and debris fall into the cracks? A: Yup, absolutely! I have three dogs, but even if you don’t have pets, floor crumbs are going to find their way into the gaps between the planks. Vacuuming the floor takes care of this pretty quickly and efficiently. Also, there really isn’t a ton of stuff in the cracks on any given day anyways, they stay pretty clean considering I have three dogs. It may be all in my head, but these floors still feel 1,000x cleaner than the carpet ever did, no matter how often I vacuumed it. Q: What kind of plywood did you use? A: I used the cheapest grade (I think spruce?) at 3/8″ thickness. Q: Do you think this would work if I painted the floors instead? A: YES! And I think if they were painted (using floor paint) you would not have to spend so much time sanding them beforehand. If you search for painted plywood floors on Pinterest, there are lots of examples that look amazing! I am actually dabbling with the idea of putting down planks and painting them in our foyer/kitchen/laundry room area, so stay tuned! Q: How are the floors holding up? They have held up amazingly well, even better than I had hoped. I can say with confidence that if you don’t have any pets, or even pets who are smaller and chill, you will not see one mark on these floors unless you’re dragging grand pianos around your house. There are a few digs and scratches in my floor from my dogs’ nails where they jump off the bed, but because I stained them so lightly and used a satin finish, you can’t see them unless you’re down on your hands and knees looking for them. You definitely can’t feel them with your feet. A: The only thing I can think of is that next time I would have Home Depot cut the boards into planks for me. I didn’t mind doing it myself, but I think if I’d had it done at the store they would have been much straighter, and installing them would have been easier. Q: Would you do plywood floors again? A: Yes, yes, 100% yes. They were the perfect solution for us and even though I had it in my mind that they would be “filler” floors to tide us over until we could afford hardwood, I can’t see us removing them anytime soon! They feel great, are easy to maintain, and they look really wonderful in the room. So that’s it! I’m so thrilled with all the interest I’ve had over the past year in this project and it has definitely made one of the biggest impacts in our house to date. If you are considering plywood floors and have any questions that I didn’t answer, drop them in the comments! « Dining Room Makeover: Full Reveal! Yay!! Thank you so much for the update!! Your tutorial is by far my fave (and you’re hilarious). We are in the process of acquiring the planks. Since I’m having HD rip them I only buy 2-3 at a time:). I must say I think your planks have a better look than mine. I’m still hopeful for good results but your grain looks much less ‘plywoody’ to me… maybe it is the stain and finish you used. At any rate I appreciate you updating, I haven’t found one person that hasn’t been very happy with the results. We hope to finish our first room this spring! Thanks so much for the kind comment, Kate! My planks looked really bad before sanding — so keep that in mind, and once I got the stain and clear coat on they were really looking good! I would love to see how yours turn out once they’re finished! If you have any questions once you’re getting into the nitty gritty, let me know! First of all, excellent job, Allison! I love the pickled look. Secondly, phenominal post with instructions, pics, opinions, AND a follow-up! Dogs and kids are killers for a house. Why not embrace it and make it wear IN and not wear OUT! Great use of the technical terms, btw. Thanks Aaron! 🙂 I am definitely forever trying to come up with solutions for “but how can we keep the dogs from ruining it…” Things go a lot smoother when I look at it from the perspective you mentioned above. Thanks again for commenting! Grama Deni your comments always put the biggest smile on my face!!! Thank you so much for your words of encouragement and support. They mean a lot and I appreciate you taking the time to read and comment on my posts. Big hugs from NS!! I want to do the plywood floor in my kitchen but the floor in concrete. Can I do this and would it be durable in a kitchen? Love your floors and my stairs are the same as yours and planning on them next. I would try to do them over the concrete? You would have to have some sort of barrier over concrete for moisture is drawn up thru concrete and dissipates into the air. In which if it was covered in plywood the wood would naturally draw it into it. Therefor the floring would eventually separated and shows signs of warping over time.. I just love the flooring. You did an amazing job. Sooo very beautiful!!! Can you tell me approximately how much it cost and the size of your room?? Hi Becky! Thank you for the lovely comment. 🙂 I think I had to cover just under 300 square feet (if I remember it was about 286) and all in (including the stain, finish, etc) it ended up costing me about $1.27/square foot, so about $380 in total. I hope this helps! Hi there! Absolutely love your floors and contemplating them for our home. We have large 18″ hideous tile that we would like to lay plywood over. They are in great shape – level And no cracks. Underneath is concrete slab. Our house is about 14 50 ft.² and it would be one heckuva job to pull up all the tile. Do you think it would be OK to lay the plywood on top? And if so do you think just the adhesive glue would be good enough? Thanks in advance for any info! Sorry I can’t be more helpful! Are your tiles vinyl, ceramic, etc? I would think that as long as you took care of any cracks, gaps, etc in the existing flooring you should be good to go: the liquid nails adhesive is super, super strong. This is beautiful!! Did you do anything to seal the edges of the plys? Also how did you handle the difference in floor height between this room to the next? Again, beautiful job. Hi Diana: thank you! I didn’t seal the edges, just applied the poly after the floors were laid. I am embarrassed to report I still haven’t dealt with the spot where plywood meets laminate in the hallway, because I hope to rip the laminate out soon and just continue the floors from the bedroom! Loved your floors! As always on a budget, hardwood floors are a dream for us. However I think we would be able to follow your example and do ours. How would we secure the wood planks on concrete? This just might be our summer project!!!! Thank you for your creativity! Sorry I can’t be more helpful! Good luck and I would love to hear how it turns out! I’m a older single woman looking for inexpensive ways to do some upgrades to my house. I think this plywood flooring would be wonderful for my 2ns story Master-bedroom, which has a plywood subfloor. I don’t remember reading how you attached the flooring. Can you please share that, and what you think might be a good suggestion for installing the plywood slats over a plywood subfloor. I am going to love reading your blog. You are an excellent humorous writer, and very detail, thank you! Lori that is so sweet! Thank you for the lovely comment and I hope you’ll stop by again soon! Do you think the boards could be stained and sealed before installed ? I want to do this in my kitchen , but the kitchen is between our living room and our bedroom so it be a lot of traffic between the steps . Would you consider putting this in a high traffic area? A living room? If not why, and if so…would you do anything different? Hi Suzi — it really depends. I think so, because I am not concerned with having super pristine floors (the “lived in” look doesn’t bother me). I think as long as you went into it expecting that there will be some scratches/dings from time to time (especially if you have young kids or pets) you won’t be disappointed. I know a lot of other DIYers have done these floors in main living areas with great success — but perhaps choosing a harder plywood would be the answer. Did you have a subfloor or did you nail/attach to a cement slab? Hi Lisa, I nailed the boards directly into our plywood subfloor. I love your floor. I will be building a small cabin in the next couple of years and want to do my floors in an old and rustic look that take minimal care. My question is regarding your spacing of the boards to accommodate swelling due to seasonal changes. Over time have you noticed any change in the gaps which would suggest you wouldn’t need to space them on your next project. Some boards shrink in time creating their own gaps which would increase the space of the gaps if you built in a gap to begin with. Just wondering if it is necessary. Thanks for your idea and instruction. Thanks Jamie! Best decision we ever made — my husband thought I was crazy at first but he is now a total plywood floor convert! What are your thoughts on staining/sealing the boards, before nailing them down? Hi Jen, there is a great tutorial that I referenced a few times in other comments where he finished his boards before nailing and it worked really well for him. I thought about doing it this way too, but when it came down to it, I don’t really have the space, and I decided it would probably be faster in my situation to finish them after. It did end up being pretty quick (I think 3-4 days for staining and clear coating) but I used a finish that was specifically designed to be fast drying. Would you do this in a wet area such as bathroom or laundry? Hmmmm, I’m not sure Brook. I think I (personally) would do it in a laundry area, but not a bathroom. Maria…I read your post/question regarding using the wiz applicator(sounds really handy), my first thought was maybe the planks aren’t sanded well or from not rubbing stain on it didn’t smooth out the surface. No sure how to explain it…some woods including plywood tends to have a fuzzy like surface, even after sanding. You might be able to use a VERY fine grit sandpaper & very lightly rub surface. GOOD LUCK! Hi Maria, I used a Shur-line pad applicator to apply both the stain and the poly. It attaches to a long pole (like a broom handle) and it just goes on like you’re mopping the floor, super easy! If you go back to my post about staining and finishing, I think I have a picture posted for more context. How has the stain and finish held up in the area under your rug? Sometimes under a rug there will be discoloration. Has that happened ? Hi Sheryl! There hasn’t been any discoloration that I’ve noticed, but it might be because the stain we used is so light? We also waited about a month after the floors were finished before laying the rug, so maybe that had something to do with it as well. Thanks for your comment! Love love this! I am a newbie and have yet started any DIY projects, BUT I am convinced I CAN do this!! LOL!! We have been thinking about hardwood flooring for a few years but the costs is what is stopping us. After reading your blog I am 100% sure we will be going this route! Any advice? My advice would be to roll with it! And to have the home store cut the planks for you if possible: it will take less time and they will be straighter, unless you’re a magician with a table saw! (I am not!) Let me know if you have any questions as you get into the thick of it, Vera-Anne! Good luck! Thank you for this post, Allison! How wide are each of your planks? I read your whole instruction about this, showed my kids and said, “I’m going to do this!”. Needless to say, I did. Home Depot cut my planks and let me just say, they aren’t perfect with cutting either. We did have to sand down several of their boards to be more even, but I’m sure it was faster overall than if I had cut them myself. I just got the flooring laid and am about to stain the planks. I can’t tell you how proud I am with my floor; I CAN tell you how much I appreciated your instructions. Very easy to read, to follow and after awhile, I knew where to go back and reference something in your post as I got ready for the next steps. Thanks so much for the post, the information and for making it so easy! Oh Anna I am SO glad to hear it! Glad my post was helpful and I hope you’re enjoying your new floors! What an amazing idea! 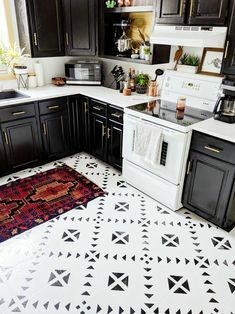 I have a Cape that was built in 1944 with beautiful hardwood floors (expect for the spots where my passive-aggressive Yorkie has peed) and I’m thinking of stealing this idea for my upcoming kitchen remodel. So happy I found you on Pinterest! I’ll be following your blog to see what you come up with next! Thanks Bonnie!! Good luck with the floors and let me know if you have any questions along the way! Something to remember about plywood versus solid wood on Concrete. If a veneer (plywood) and it gets wet it will absorb and not warp or buckle. If you use sold wood and it gets wet it will bow up like a sick toad frog. Also if you are going to cut the plywood planks yourself you need a table saw to cut straight. If you use a hand held saw like a skill saw it will be very hard to get straight cuts without a guide. It’s so much better to get Lowes or Home Depot to cut for you! My husband and I just bought our second “flip home” and rather than putting in hardwood, we are going to try this! So a big thanks!! My question is, when leaving those spaces between boards to prevent buckling, could you fill them in with a wood filler? We did a DIY butchers block project to our counter tops and my husband used the wood shavings from cutting the boards, mixed with a wood filler, and filled in the small cracks. It turned out great. Just wondering if I did that to the floor if it would still have the hardwood look and allow for any swelling that the wood may do. Hi Melissa! I honestly am not sure — it would probably look similar to what you’d done on your counters, just on a larger scale! Also it is worth mentioning that a few commenters have pointed out that plywood is manufactured in a way that it won’t swell/shrink with changing environments — so it may not even be necessary to leave any gaps at all. I would definitely look into that as well — gaps were kind of a must for us however because I did such a terrible job ripping the boards and a lot of them were pretty wonky, haha! Good luck! I have an old farm house, and the previous owner put in very unattractive dropped ceiling. What would be your opinion to replace the drop ceiling, with this kind of flooring. I have wires and old beams underneath the ceiling? Hi Allison do you think this plywood floor will work over stone tile? I would caution against having Home Depot or Lowe’s rip the wood for you. Yes, their machine looks wonderful, but if the operator does not gap the higher piece during a rip, the top piece falls into the blade during the cut and you do not end up with a straight edge. The bad edge than propagates to all of the next cuts and can get even worse. Since the sheet is rolling past the blade, it all depends on how the operator pulls the sheet. Believe me, I know this because I just had them rip a $50 sheet of the 3/4″ birch plywood and the cuts were not at all straight. I had to clamp a straight edge to them and re-cut on my own. I have a technical question. I was thinking of doing the exact same project with plywood floor – by the way it looks gorgeous, quite expensive and I love the look! The only problem is: I live in the wetest place in Canada. It rains a lot in Greater Vancouver and that makes me question wether or not it’s necessary to coat all of the boards with some kind of anti-mold agent or not. How are your floorboards holding up to moisture? Hi AJ! Thank you for your comment! Here in NS we don’t get a ton of humidity/precipitation, but even still I have had ZERO issues with the floors. I also have mopped them several times with Pinesol and the water does not seem to bother them at all. I think as long as you sealed them with the clear coat you should be good to go! The cheapest and even some of the not so cheapest grades of plywood have all or part of a knot missing. How did you handle the holes? Your floors are beautiful. We have an 1939 pier and beam house. The floors are very uneven . Do you think this type of flooring would work? Hi Kathy. Thank you so much! I am hesitant to give an opinion on whether or not these would work in your situation since 1. I have not seen your space and 2. I am not a contractor!! That being said, you could always try in a small room first and see how they worked out as a trial run? First, I’d like to say: thank you so much for taking the time to give so much information on the process and for responding to so many questions. Have you had any experience with any liquid spills that have gotten between the boards? Either everyone is much more careful than I am, or there never arose a problem to report. Also, was the plywood you used rated for exterior use? I’ve seen a few people mention using the cheapest grade and all of the cheap stuff is rated for exterior at my Home Depot. I was told that the glue used on exterior plywood is not good to have in the house. Any info on this would be soooo greatly appreciated. I’m totally set on going this route for my home, but I just can’t commit on which plywood to use. I’ve read both parts of your install and your 1 year later update, but I’ve also read quite a few other installer’s how-to instructions, so I apologize if you’ve addressed this and I missed it.